You are here: Home » Featured » What Happens When Faith Finds Us? What Happens When Faith Finds Us? Throughout this Year of Faith we have been looking primarily at what individuals and communities can do to spark a more sincere approach to the faith. We have written and talked a lot about helping ourselves and others commit to regular church attendance, catechetical growth, and finding ways to serve others in such a way that they know it is because of our commitment to Christ and His Church. While these activities are absolutely essential to our growth as Christians, they certainly suggest an approach that is human-centered. In other words, much about the Year of Faith seems to be about what we’re going to do, but are we also learning to let God work in us? Probably much less than we think we are. Here’s how I know: even after spending years watching and listening to Jesus Himself, even the Apostles still needed to learn more about how God would work in and around them. This is important to us during the Year of Faith because we must remember that no matter what initiatives we embark upon for ourselves or disseminate throughout our dioceses, nothing can replace the work of the Holy Spirit. Of course, this does not mean that we abandon the Church, stop going to Divine Liturgy, or eliminate catechesis. In fact, the opposite is true. But what it does mean is that for all of the planning that we do, the Holy Spirit will surprise us by quietly moving mountains in order to get us to live out the will of God. That’s the moment when faith finds us. That’s the moment when all of our plans go out the window. And that is when we will be shocked beyond belief what God has in store for us. St. Matthew, whose feast is September 21, is an excellent example of someone whose life was changed in ways he least expected. He went from being a marginally-Jewish tax collector to an apostle of Jesus Christ. That is why he so aptly teaches us: “Do not lay up for yourselves treasures on earth, where moth and rust consume and where thieves break in and steal, but lay up for yourselves treasures in heaven, where neither moth nor rust consumes and where thieves do not break in and steal. For where your treasure is, there will your heart be also” (Mt 6:19-21). Thus, his lesson to us is simple: pray and have faith in God! 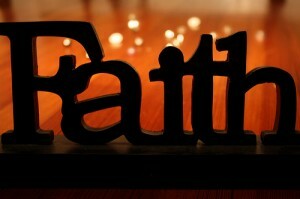 So, during this Year of Faith, please ask yourself this: am I allowing God to work in me? Am I willing to go where the Holy Spirit calls, like St. Matthew? Am I living strictly for God? Let us pray for one another so that we may live our faith in this way.